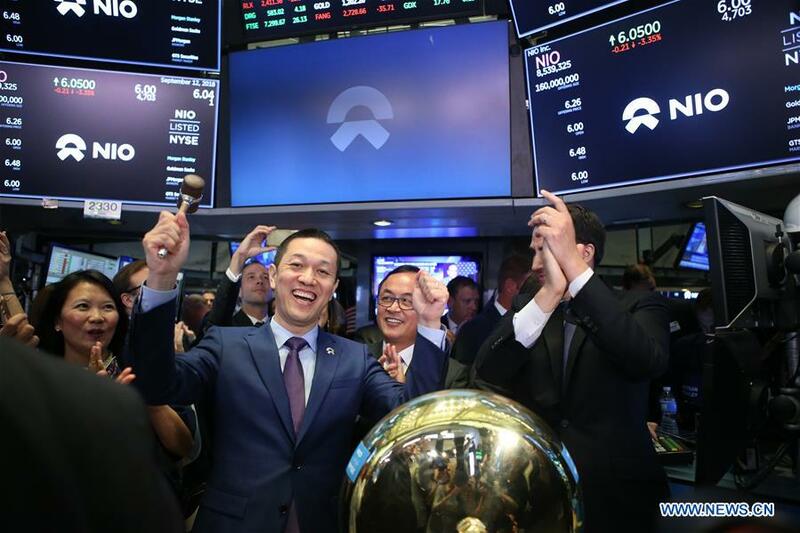 NEW YORK, Sept. 12 (Xinhua) -- NIO Inc., a Chinese electric vehicle start-up, rang the New York Stock Exchange (NYSE) opening bell on Wednesday in celebration of its initial public offering (IPO). The company, trading under the ticker symbol of NIO, announced the pricing of its IPO of 160,000,000 American depository shares (ADSs), at 6.26 U.S. dollars per ADS for a total offering size of approximately 1 billion dollars, assuming the underwriters do not exercise their option to purchase additional ADSs. Each ADS represents one Class A ordinary share of the company. NIO started trading at 6 dollars per share on Wednesday, and was traded at 6.27 dollars apiece around midday. Founded in 2014, NIO, dubbed as China's Tesla, is a pioneer in China's premium electric vehicle market. It began deliveries of the ES8, a 7-seater high performance electric SUV in China from June 2018 and plans to launch ES6, a 5-seater electric SUV in late 2018, according to the company. William Li, founder and chairman of the Shanghai-based electric carmaker, told Xinhua that the great potential of the Chinese market and the robust and competitive industrial base there have injected great momentum into his start-up. The fund raised will mainly be used for research and development of products, services and technology, building sales channels and manufacturing facilities as well as the roll-out of its supply chain, according to its filing.